Home air conditioners have become a standard, even in a place like the UK where, traditionally, air conditioners were not needed, particularly for the home. But with temperatures becoming warmer, especially during the summer months, more people are deciding to install air conditioning for their homes, whether it’s for the entire home or just a single room such as a bedroom. All of us deserve comfort, after all, and if you want your home to be truly comfortable and at an ideal temperature every single day, having an air conditioning system certainly helps. But once you have an air conditioning system or unit, it would be best if you know how to properly maintain it so that you can prolong its lifespan. How, then, can you maintain and prolong the lifespan of your home air conditioning system? Here are some top tips. First of all, you should know how your system or unit works. Most air conditioning systems will have two essential parts: a unit that is located outdoors, and a unit that is indoors. The outdoor unit is the condenser or compressor, and the indoor unit is the evaporator, which is usually in a centrally-located duct. Of course, some air conditioning systems can also be different, so what you can do is get some information on your own particular unit from your air conditioning installer or maintenance service. In order to keep your air conditioning unit clean, make sure to cleanthe outdoor unit’s fins with a brush with soft bristles. Bear in mind that the fins are fragile as you can easily bend or crush them with rough handling, so be careful. Many air conditioning units will come with a metal box which you may have to unscrew and remove in order to get to the fins. To make it easier on yourself, check the manufacturer’s instructions. The concrete padding or platform underneath the air conditioning unit located outdoors should also be in good condition, which means that it should not be sinking. Whilst it’s normal for the pad or platform to settle over time, it shouldn’t be settling too deep. Check the coolant tubing (made of copper) and make sure it is not strained and check the electrical lines as well. If the air conditioning unit is relatively level and dry, this is a good sign. But if there are puddles of water around the air conditioning unit, this could be a sign of a worse problem, and you may have to call in the professionals, such as the experts in air conditioning and electrical services in London from Sub-Cool-FM. 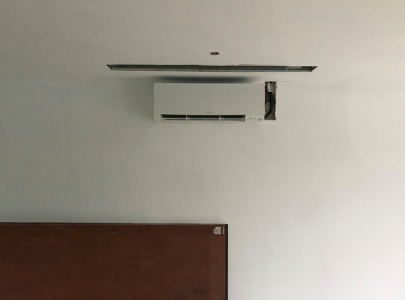 Most air conditioning units and systems released nowadays have very low noise levels, so this shouldn’t be a problem if you have a new unit or system. But if you have an older system, the compressor may be making some level of noise. You can contact an air conditioning specialist to provide you with a ‘sound blanket’ for your compressor. Installing it is easy but remember: if the noise is coming from an older compressor, and it is excessive, you may have to replace the compressor.